Home » News » Are wood burning stoves going to be banned? This week has seen a fresh batch of misleading news headlines following the unveiling of the governments new Clean Air Strategy, which has prompted a number of our customers to question whether wood burning stoves are going to be banned. The simple answer is no, but there are a number of proposed changes that our industry is already working towards. The stoves industry is continually pushing forward to increase efficiencies and make cleaner burning appliances; From CE marking to DEFRA approval, standards have improved for the better over recent years and will continue to with EU Ecodesign regulations set to come into force in 2022. The key aim is to reduce air pollution, with the focus being on lowering particulate levels. In recent years wood burning stoves have become an easy target, without a big voice to defend against attention grabbing headlines that do a great deal of damage to the industry and effect independent retailers throughout the UK. Coming from the right angle, the story could actually help provide the positive outcome that the Clean Air Strategy is aiming for, so let’s look at the details. 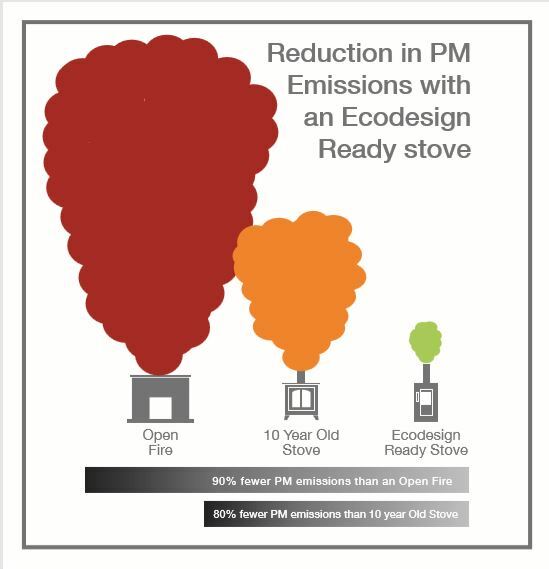 Open fires and stoves around 10 years and older are less efficient and produce higher particulate matter (PM), whilst the latest Ecodesign Ready stoves can produce 90% fewer PM emissions than an open fire and 80% fewer than a 10 year old stove. Ecodesign is a European-wide scheme programme with strict PM limits 55% lower than for DEFRA exempt stoves to lower emissions. It is due to come into force for stoves in the UK in 2022, however many manufacturers have seized the initiative to produce stoves that already exceed these targets. These stoves can be identified by the Stove Industry Alliance ‘SIA Ecodesign Ready’ logo. So clearly, this newer breed of stove should be encouraged and anyone buying in the near future should consider an SIA Ecodesign Ready stove, not just for the environment, but because they will lower bills by using less fuel. However, the Ecodesign initiative will not be applied retrospectively, so any stove currently in use or bought before 2022 will still be able to be used. An aggravating factor in the bad press stoves have received, is often the fuel that is burnt. Whilst coal emits sulphur dioxide, wood should be championed as a carbon neutral fuel as a tree absorbs as much Carbon dioxide over its lifetime as it releases when burnt and of course is a renewable resource. The Clean Air Strategy rightly recognises that all wood burning is not the same and that to reduce particulate emissions, in addition to installing an Ecodesign Ready stove it is important to burn dry logs. Woodsure, a not-for-profit organisation, striving to raise the quality of wood fuel has devised a government backed certification scheme with this in mind. The ‘Ready to Burn’ accreditation and accompanying logo gives the end user confidence that they are buying dry wood that has been properly sourced and seasoned meaning it produces fewer particulates, more heat efficiency and less maintenance – chimneys are less likely to block and will remain easier to sweep. There’s no need to panic, wood burning stoves will not be banned. You can still use your old stove. New regulations come into force in 2022. You can buy a new highly efficient, clean burning stove now. Buy dry fuel to lower emissions and get the best from your stove.